We’ll focus on Olivet, and will refer to it as the Mount of Olives, as that is how it is typically translated in our Bibles. It is rich in history! David went there weeping, to escape his son Absalom (2 Samuel 15:30-37); Ezekiel looked on as the glory of the Lord left Solomon’s temple to hover over the mount (Ezekiel 11:22-23); in a vision, Ezekiel witnessed the prophetic event of the glory of the Lord returning from the east (over the Mount of Olives) to a new temple (Ezekiel 43:1-5); and Zechariah prophesies that, at His return, the Lord’s feet will one day stand on the Mount of Olives and the mountain will split in two (Zechariah 14:3-5)! Here’s the view Jesus would have today if He stepped foot on the Mount of Olives. The small city of Bethany lies on the eastern side of the Mount of Olives, about 2 miles from the edge of Jerusalem, and was home to Mary, Martha and Lazarus, Jesus’ closest friends in the area of Jerusalem. Scripture tells us that Jesus often spent time in Bethany. (Luke 10 and John 11, for example). 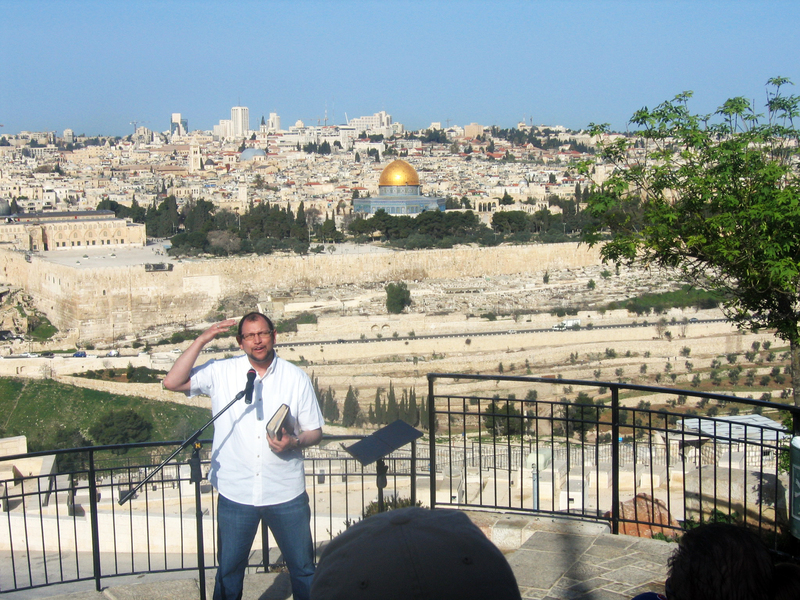 Jesus also described the prophetic future of Jerusalem, including its destruction, while on the Mount of Olives (Matthew 24-25, Mark 13, Luke 21). Likewise, after Jesus’ resurrection, He ascended to heaven from the Mount of Olives (Luke 24:50-53, Acts 1:9-12). Now for a fuller view of the Mount of Olives, from Temple Mount! (Can you just picture Jesus there with His disciples? Or ascending to heaven from this hilltop!?!) Notice all the olive trees! Here is the Kidron Valley that lies between the city walls (to the right) and the Mount of Olives (to the left). 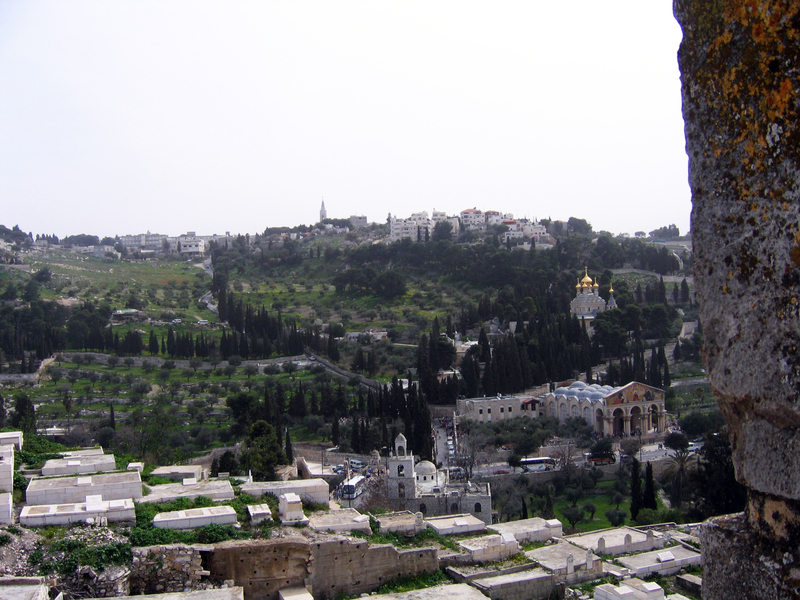 On the Mount of Olives is the Garden of Gethsemane. Did you know that Gethsemane means “oil press?” It was in the Garden of Gethsemane that Jesus was “pressed” until water and blood poured through His pores. The Gospels (Matthew 26:36-46, Mark 14:32-42, Luke 22:39-46) tell us that He took His disciples there and, in agony, asked them to pray. Instead, they fell asleep. Jesus was about to literally take on the sins of the world when He prayed, “Father, if You are willing, please take this cup from Me, yet Your will, not Mine, be done.” He was then arrested and taken to trial. He would soon be crucified…taking on your sins, mine, and those of the entire world. It is no wonder he sweat drops of blood. Olive trees are very difficult to destroy. Thus, though the Romans burned everything down, and other attempts have been made to remove olive trees from the area, ancient trees from the time of Jesus still stand! 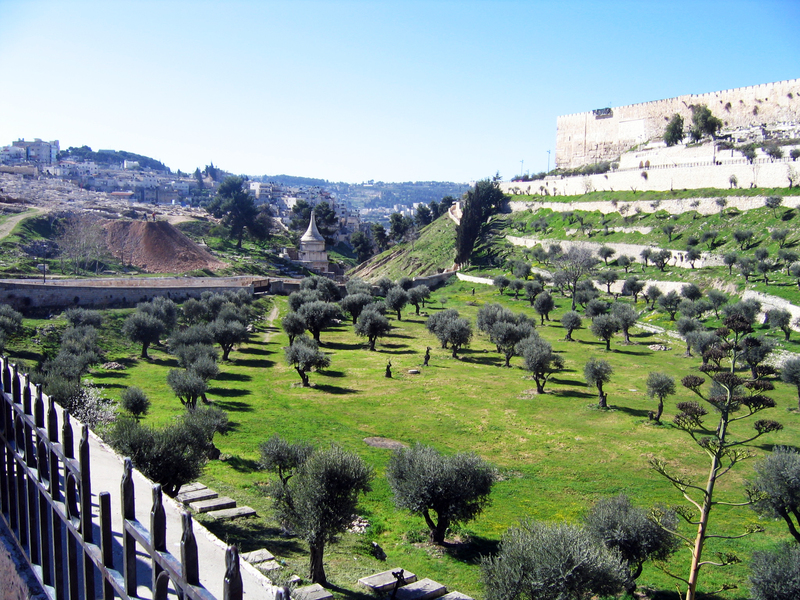 Here are some shots of the Garden of Gethsemane and the ancient olive trees. 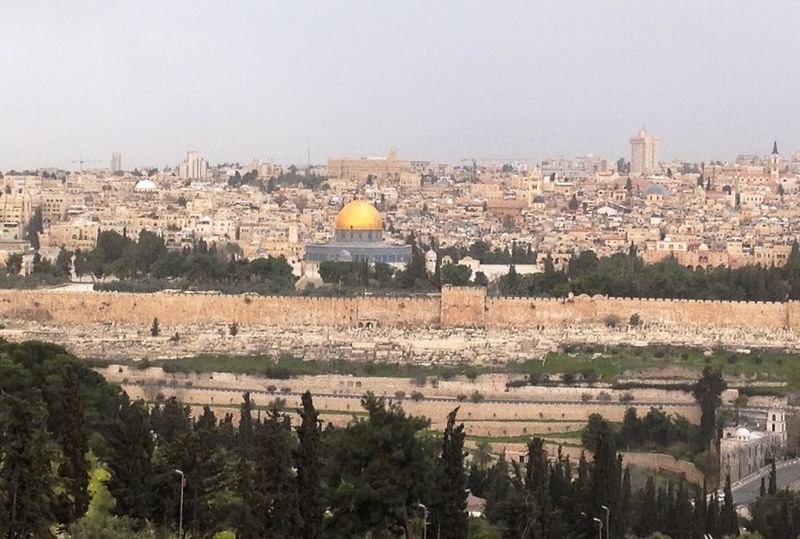 There you have it…the Mount of Olives. An amazing place! Thanks for sharing today’s journey with me! Join me again tomorrow for more!